Pre-Monet realism in painting consists in painting the objective reality, that is things as they are, without the interference of a subject’s perception, or of his emotions or his interpretation. The aesthetic experience consists essentially of a visual beauty inherent in things or their combinations when viewed as reproductions in art. Essentially , a duplication of the sensory experiences one would go through if one were to watch the scene, with a physical presence at the scene. For example watching the sunset is a pleasurable experience of the senses and if one were to see it reproduced in a work of art or in a photograph one would essentially go through a similar experience. Such reproductions are art and have the same pleasure giving sensations as real life they are trying to copy. In Plato’s theory art is a copy of a thing which is a copy of the Idea and an artistic reproduction will make the beauty of the thing gross by being twice removed from reality. Because only the Idea is the real thing. In Realism art imitates the thing which itself is a copy and thus such art cannot be “pure” but the proponents of realism believe that a realistic,not realized, representation of things produces the same pleasurable sensations as the Real thing. Here we are not talking about realism which includes all real things because all real things in life do not give us the same pleasurable sensations. For example, a plain white wall does not evoke a visual beauty but color it, set it as part of the room and furniture, view it in the morning’s sunlight or the afternoon shadows and it gets transformed into a thing of beauty and a realist painter will paint such a scene that will give the same visual pleasure that the original scene gives. Of course the question arises if the painter paints merely the drab white wall , will it give an aesthetic experience ? Of course not. So even in Realism there is an element of choosing, the way things combine to produce a pleasant sensory experience. If that were so, we would not be justified in saying that there is no element of subjectivity in the realistic art. Subjectivity is definitely there ,in the way the mind looks at the combination of things or in the viewer’s perspective . There is a way to look at things , the way light falls on them, the way they combine with other objects to make for beauty and a realist painter captures beauty this way. Essentially all things have light in them, the way they speak to each other, they join the stream of life. The way they share space with other things in the room, in the garden, in the lake, in the sky. The artist’s vision captures the light inherent in the things and captures the very essence of things, the nature of their being. When, in Havre ,Monet painted the sunrise at the port he did not paint the port as a realist painter would .He might have started out with the objective of painting the port of Havre but ended up with the painting named Impressions:Sunrise .The painting was not a realistic reproduction of the port of Havre or of the sunshine, with details of the ships in the background in haze and short swift strokes that made the sea an impressionistic view of the sea at sunrise. If painted in realism the sea would be like any other sea, the sunrise like any other. Somewhere along the way the painter gave up his pursuit of realism ,that was merely a copy of an actual experience of the scene and fell unconsciously into an emotion stirred by the beauty of the scene that was much more sublime than a visual enjoyment of a tranquil sea at sunrise. An impression is a complex feeling created by a thing of beauty that is unique to the individual who is experiencing it and is a subjective interpretation of an objective reality. Nature poetry can be an aesthetic experience similar to the experience of the painter. Like painting poetry can be about both an objective reality reproduced for an experience similar to realistic paintings and the much more sublime Impressions, complex emotions stirred in the poet by nature, men and things, singly or in association with others. The poems about nature can be realist depictions of the beauty of nature like Wordsworth’s “My heart leaps up when I behold/A rainbow in the sky…”,poetry recollected in tranquility. It can also be a complex set of the poet’s emotions when confronted with the object of beauty, a kind of “spontaneous overflow of powerful feelings” that takes away the precise outlines from the elements of the scene, creates a haze and goes on into the realm of the abstract. 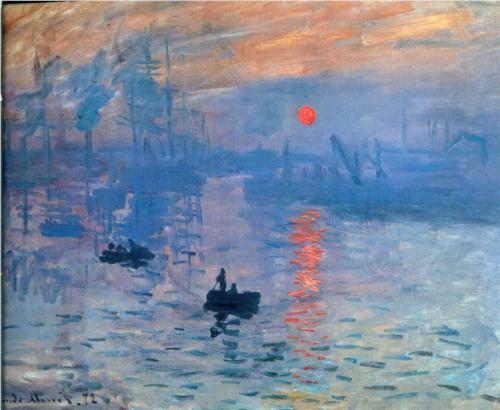 The effect is created with “short swift brushstrokes” such as Monet does in the Sunrise painting, a kind of not going all the way but leaving the viewer halfway to figure out the details by himself. The brush strokes are short and swift, like broken waves of the sea that do not exist in real life but are a possibility and contain a universality of experience much beyond the experience of watching the real life sea. The human experience is not merely confined to objective realty but encompasses a much larger canvas ,if human mind is also treated as part of nature and a human mind’s perception about nature is nature perceiving itself.